"The Force" has awoken in the California Bay Area. 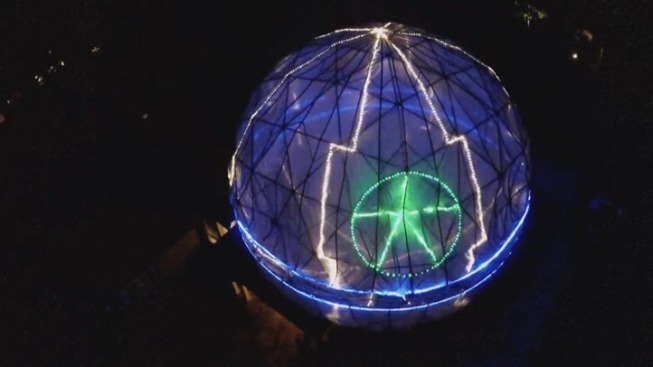 Homeowner Colby Powell built a Death Star space station on top of his house in Lafayette, about 30 miles east of San Francisco. Powell created the 23-foot replica for Halloween, according to a YouTube video he posted this week, and kept it on his roof in anticipation of the new "Star Wars" film opening in theaters next month. In the wildly popular science-fiction series, the Death Star is a moon-sized weapon equipped with "the ability to destroy an entire planet," according to the official "Star Wars" website. Powell and his family used 162 geohubs, 18 cans of paint, 2,000 feet of PVC conduit and two massive parachutes to create the $2,000 masterpiece. Powell documented the massive undertaking in a two-minute video now viewed more than 8,000 times. In his "film credits," Powell thanks his "amazing and patient wife," his "adorable children" and his many other helpers, including those who provided social media advice and "dessert support" for hungry workers. Contact Lisa Fernandez at lisa.fernandez@nbcuni.com or 408-432-4758. Follow on Twitter at @ljfernandez.